St. Andrew’s United Church seeks to become an inviting, open and accepting community where young people of all ages can explore and celebrate their spirituality. Known as the “Red Roof Church“, once you arrive in Rossland unless it’s a foggy day, you can see St. Andrew’s United Church from most places in town. 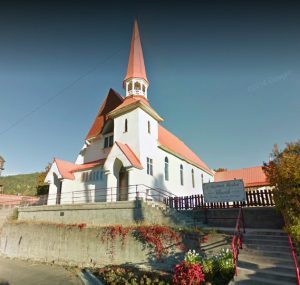 A “Certificate of Trustees Asking Consent of Presbytery” was approved regarding St. Andrew’s United Church, Rossland, for the 2-year lease of their building to Visions for Small Schools Society to have a new campus in Rossland for the Seven Summits Centre for Learning for the period of July 2017, to July 2019. The congregation will continue to have access to their building for worship and special events. 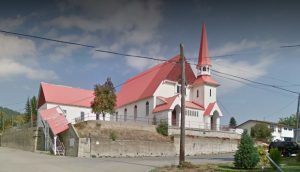 St. Andrew’s United Church was founded in 1895 with the purpose of bringing the Presbyterian faith to the small mining town of Rossland, British Columbia. The first religious services were held on the last Sunday in May 1895, in a partially constructed butcher’s shop. The first church was erected in Nickel Plate Flat and opening services were conducted on August 28, 1895. Although originally a Presbyterian church, St. Andrew’s would, in 1917, vote to unite with the Rossland Methodist Church (founded 1897). The name and church of St. Andrew’s were retained for the new church, however, Methodist ministers continued to lead “union” services from 1918-1925. After this time the church was referred to exclusively as St. Andrew’s United Church and United Church services and ministers were used. By the late 1960s, there was a spirit of growing cooperation with the local Anglican congregation, St. George’s. Negotiations with St. George’s Anglican Church regarding the sharing of services and buildings through a lease ended with a five year lease being approved by both congregations in 1969. Shared services were held between St. George’s and St. Andrew’s until 1982, when St. George’s terminated the arrangement. Major renovations to the church building were completed by 1985. The church continued to grow into the 1980s, recording a membership growth and budget surplus by 1987.